I write my reviews as I read. I’m sure most do it’s the only way to really express the nuances and little things you notice as you are reading, as opposed to trying to remember when the story is over. This partly explains why I’ve been mostly absent this year; my review file was lost when I moved computers and I can barely remember what I read this year, let alone what I thought about them. I had this review nearly ready to go with 50 pages left in the book, all that was needed was a last couple sentences. Then I was blindsided with an ending I absolutely did not see coming. After 15 Pendergast novels (and more stand-alones from the duo) I have to give it up to Douglas Preston & Lincoln Child because this book was one hell of a head feint lulling this reader into complacency before knocking me to the mat. Well done, gentlemen. Well damn done. If you are casual to the series you may not understand what is happening at the ending, but for long time readers prepare to be horrified, shocked, and perversely delighted. For the first time in a while, I can’t wait for the next one. Incidentally, it is called The Obsidian Chamber and comes out Fall 2016. Don’t bother looking for a plot description, they are playing this one very close to the vest. The review below is my impressions just before going in to the climax of the book. It’s a 3 star review but with that gobsmacking ending I’m giving it 4. Some of my statements and assumptions below are wrong. But I’m leaving them in because like the book itself, there are red herrings and misdirection that just enhance the suspense. If you want a fun (and very bloody) ride, Crimson Shore is worth the time. Special Agent Aloysius A.X.L. Pendergast is back and this time he’s investigating the theft of a priceless wine collection in the small fishing village of Exmouth, MA. Along with the lovely Constance Greene (I’m not even going to try to go into her background), Pendergast quickly ascertains the theft was a front for a more sinister crime. Soon after Pendergast’s arrival a visiting historian is found murdered and mutilated in the nearby salt marshes. His body covered in strange runes carved in to his flesh while still alive. Signs point to a hidden coven of witches, fled from Salem long ago, and still practicing today. As Pendergast investigates the residents of Exmouth will be forced to face an unspeakable act from the town’s past, as well as an even darker secret it currently hides. Despite growing fatigued with the formulaic nature of the stories I’m still a fan of the Pendergast novels. They can always be relied on to be at the very least entertaining “beach reads” (I live nowhere near a beach. In this case “beach reads” refers to “exciting and somewhat silly thriller to read on my couch and lunch breaks”). I would prefer if Preston and Child would get back to the ensemble stories of the past but compared to recent outings Crimson Shore is more solid than most. It’s better than Blue Labyrinth or White Fire and more plausible than the Helen trilogy (the 3 book series begun with Fever Dream). For one thing, the plot is well done and a compelling mystery. For another, the story takes some interesting turns before it is over that harkens* back to the very beginning of the Pendergast novels. I won’t say any more there because it’s worth experiencing on your own if you are a fan and intend to read the book. And if you are a fan you SHOULD read Crimson Shore. It moves fast, containing a heightened mix of mystery, thrills, and violence. The characters are drawn a bit more shallow than usual with the exception of Constance who is starting to stretch her boundaries a bit. It’s fun to see her interacting with average people and how they react to her dress and countenance. More than once people assume she is Amish which is pretty amusing. 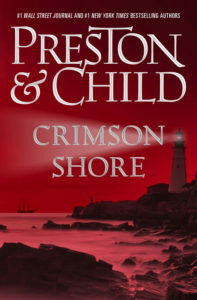 To sum up, Crimson Shore is a solid late-career entry for Preston & Child and an entertaining outing for Pendergast. At this point the main characters are all but bullet-proof but it’s still fun to see them get in to, and out of, one dangerous situation after another. And this may be one of the only time Pendergast ends up being wrong about something. Mark your calendars for that one, kids. It happens about as often as me coming up with a clever metaphor. *Cool kid points to you if the phrase “Hark hark harkened he!” flitted through your mind when you read this word. Share the post "A diabolical and clever thriller"
Like hope, stupid also floats. I’ve been wondering where you’ve been! Sorry to hear about your lost reviews — that would make me crazy. I’ve been reading the Pendergast books for years — since middle school, in fact. I stopped a few years ago and have fallen woefully behind in the series. Sounds like I might need to get back into it! Thanks! Yeah, I had to make myself start writing again. I was pretty annoyed. Where did you stop at? I’ve read all of them (including the duo’s solo novels) and can tell you what you can safely skip if interested.